What is your approach to meeting the requirement now? Most companies have developed and implemented procedures that ensure controllers do have an opportunity to get eight hours of continuous sleep. They consider the commute times and times for shift exchange. They have methods for recording hours of service and therefore can demonstrate that controllers do have off-duty tine sufficient to achieve eight hours of continuous sleep. As far as I know, no managers follow people around during their off-duty hours or peek in their bedroom windows to see if they are asleep. Companies do not make people report their hours of sleep, although they do encourage all employees to get an adequate amount of sleep. That encouragement mostly takes place through fatigue risk management training and education. One of the challenges to getting eight hours of sleep is when the shift change times are around 0400 and 1600 for day shift and 1600 and 0400 for night shift. This works well to provide a better sleep opportunity for those on night shift, since they get home before daylight. Those on day shift have to go to bed around 6:00pm to get eight hours of sleep. That is unrealistic in most households so controllers should go to bed as early as possible. 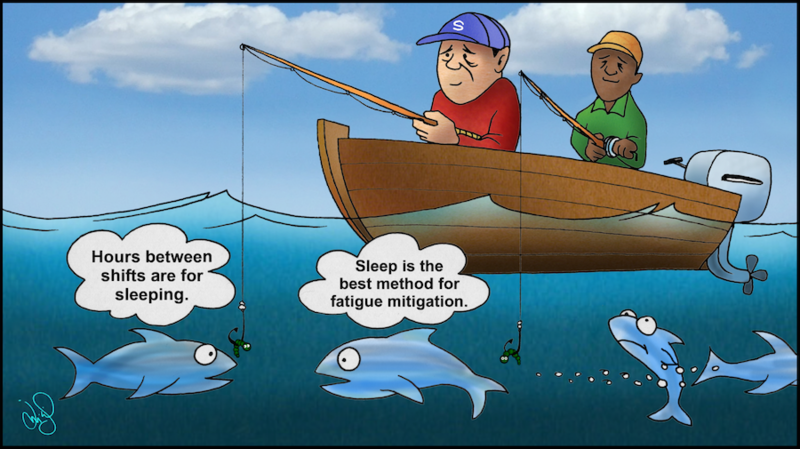 In those situations, companies should emphasize the use of fatigue countermeasures on both day shifts and night shifts. If you use FAID® or some other fatigue modeling software, educate the controllers on the potential fatigue risks of day shifts that begin before 0600 as well as on the night shifts. We have had opportunities to work with many controllers since 2010. The amounts of actual sleep they report is similar to what most shift workers report: five or six hours when they are working night shift and six or seven hours when they are working day shift. Most “pay back” their sleep debt on some of their days off. Those who have the hardest time getting adequate sleep are ones with some type of sleep disorder. Parents of young children also report challenges. Due to the continuing emphases on the importance of sleep and rest, most controllers seek to get as much sleep as possible between shifts, even if it is not eight hours of continuous sleep. One of my neighbors in Tennessee in the 1980s worked eight-hour evening shifts at the Ford Glass Plant. In the summers, he went fishing most nights after he got off work, slept from 5:00am to 2:00pm and then went to work. If he had worked 12-hour shifts, he would not have been able to get sufficient sleep. Most controllers today work 12-hour shifts and should not be fishing for five hours between shifts. They also should not be golfing, playing hockey, or doing much besides sleeping. Use your days off for personal activities. Don’t be like a man who used to work for me. When we went to 12-hour shifts and he was going to have 14 days off out of 28, he told me he was going to get a second job. I told him that second job would become his only job. Share the responsibility for fatigue risk management with the company. Use your off duty time between shifts for sleep and rest.